Haleakala means 'house of the sun' in Hawaiian and our affordably priced condos for rent at the Haleakala Shores Resort will surely be your house in the sun! We are located directly across from the beautiful Kamaole III Beach Park, giving you the opportunity to soak up the sun at your convenience! The Kamaole beaches are world class and well equipped with lifeguards, restrooms, showers, as well as picnic areas providing you with everything you need for a great day at the beach! Our Hawaii vacation property is located centrally in happening Kihei town! There are many vendors in the area which will cater to your ocean activity requests, including shops which rent paddleboards, snorkeling equipment, and boogie boards. There are also lots of dining, shopping, as well as nightlife options just a walk away from your cozy condo rental at Haleakala Shores. You'll find luxury shopping, as well as breathtaking golf and tennis facilities, are just a short drive away in the resort area of Wailea. 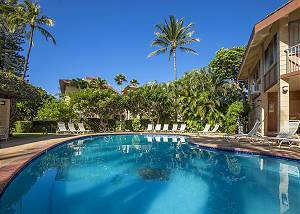 Choose Haleakala Shores condominium resort for your dream Hawaiian vacation! You'll find that it is also one of the most affordable two bedroom vacation properties in the Kihei area. Although interior furnishings will vary from unit to unit, you can expect large floor plans with well-equipped kitchens, in-unit washer/dryers, and private lanais in each. Snorkel, stand up paddle, and swim the day away across the street at the beach, and then end the day watching the beautiful Hawaiian sunset from your private lanai or even barbecue outside while the kids finish the day splashing around in our glassy pool. While there is much to do in the Kihei area, our location lends itself to easy exploration around the island to make your journey from Haleakala Shores to Haleakala Summit a breeze. Come stay at Haleakala shores for accessible beautiful beaches, well appointed - yet affordable accommodations, and a fun-filled vacation for all!